In 2003, I wrote about the Cambodian Master Performers' Program, which was set up by a young trdo ui (upright fiddle) player Arn Chorn to document and preserve traditional Khmer music. Chorn had escaped the killing fields of the murderous Khmer Rouge regime to the refugee camps on the Thai border and eventually made his way to Lowell, Massachusetts, in the USA. Many of his peers and teachers, however, were not so lucky: Some 90% of the country's traditional and popular musicians were either killed or left for exile in a new country. The master chappei dong vang (long-neck, two-string lute) player and singer Kong Nay was one of the few to survive. There were many times he thought he and his family would perish but perhaps because of his musical ability he survived. The programme, now renamed Cambodian Living Arts and based in the US, England and Phnom Penh, brought Nay and nineteen other surviving traditional musicians in to teach young students, thereby passing on their skills and experience to a new generation. A studio, sponsored by Peter Gabriel's hugely successful global Womad festival circuit and the related Real World record label, was set up to record the master teachers and their students. Nay, who lost his eyesight to smallpox when he was a boy, has been playing his instrument for nearly 50 years and is acknowledged as one of Cambodia's finest musicians. His first international album on the French Inedit label was a revelation and led to tours overseas, including a successful extended tour of the UK. Chappei masters are rather like a cross between a US delta bluesman and a shamisen troubadour from Japan. His music, often improvised around a basic song structure, features satirical and often humorous songs that dispense a worldly wisdom on topics of interest (he steers clear of politics though). 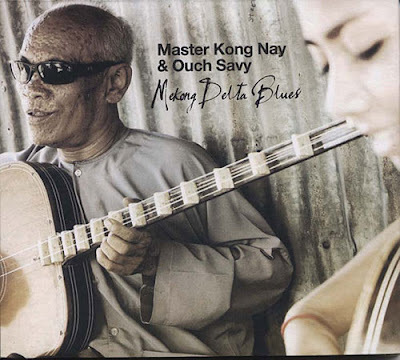 I was in Phnom Penh last week, hoping to catch the master performing but alas he was playing down by the beach, so I decided to try to find his 2007 release on the Real World Works sub-label, Mekong Delta Blues, instead. Not an easy album to find there as it is an international release but I did find a copy in Monument Books (you can find the album on Amazon.com and there are various sites that offer MP3 downloads; the Cambodian Living Art site also has one or two sound samples of Nay's work). I've wanted to get this album for some time, as some of my friends in Phnom Penh have told me that his student, Ouch Savy, who also appears on the album, is a fine player and singer. Although she comes from a famous musical family, Savy is one of the very few female chappei players and at 21 she has already appeared on Cambodian TV many times and has played all over the country, often with her mentor Master Nay. The 12 tracks on the album were recorded at Philipthearan Temple in Battambang province and at Studio CLA in Phnom Penh during September 2006 to July 2007. Kong Nay kicks of the album with the pulsing Farewell Wishes, which segues into one of my favourite tracks, Brown Phalla, which bubbles along on a jaunty rhythm over which Nay dispenses words of wisdom in his trademark gravelly voice. Ouch makes her first appearance on the album with a delicate song, Khmer Ladies Virtue, which features a 30-second wailing vocal intro that gave me the goosebumps (rather like one of those atmospheric intros to a maw lam glawn song) and some beautiful chappei playing - she has a softer attack to her playing than Nay and more trills and embellishments in her riffs on the instrument. She features on several other tracks, including the more strident Parent's Legacy and my favourite, the standout of the album, Kadeuk Breeze, the latter of which features a thudding bass line and buzzing string sounds; her vocal on this track seems to float, well, on the breeze. The only song the two perform together is Ramvong, a "circle dance" and style of music as well known here as it is in Cambodia. The two alternate verses, with Ouch's soft vocals contrasting nicely with Nay's more gruff singing style. Her final song is the lament Missing My Youthful Beauty (if she's singing that at 21, then there's no hope for the rest of us). Nay completes a wonderful album with his view of what's to come in life on The Future of Cambodia. If it is up to Kong Nay, then I'd say the future of the country is in good hands. This is a terrific album, well worth checking out. You can see Nay and Ouch play on YouTube and visit http://www. 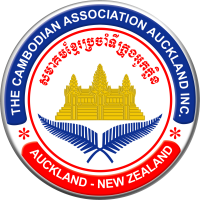 cambodianlivingarts.org. Translations of the song lyrics are also available at http://www.cambodianlivingarts.co.uk.